Coronary artery bypass grafting is a surgical procedure which aims to improve blood flow to heart muscle. It can relieve symptoms such as angina as well as reduce cardiac breathlessness and reduce the chance of a heart attack. The coronary arteries are vessels that supply blood directly to the heart muscle. If these vessels become narrowed or blocked from coronary artery disease, the supply of oxygen-rich blood to the heart muscle is reduced and can cause tissue damage and symptoms. 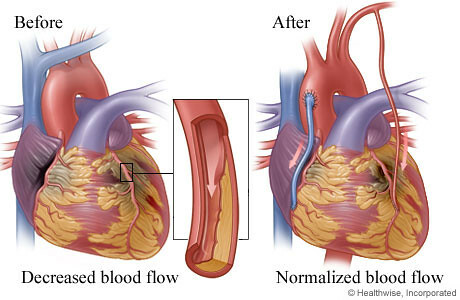 During bypass surgery, a new disease free blood vessel is taken from your body and used to bypass the diseased heart vessel in order to supply blood to your heart muscle. This new blood vessel can be created from lengths of vein taken from your leg or from an artery in your arm, or by redirecting the ‘internal mammary artery’ from inside the chest wall to your heart. The removed vessel is called a graft. Consequently, overall current evidence favour CABG as the revascularization modality of choice for patients with diabetes and multivessel disease. When patients present with a comorbidity that increases surgical risk, the choice of revascularization method is best decided by multidisciplinary individualized risk assessment. The use of bilateral internal mammary arteries (BIMA) should be considered in all patients with a reasonable life expectancy and a low risk of sternal wound complications. 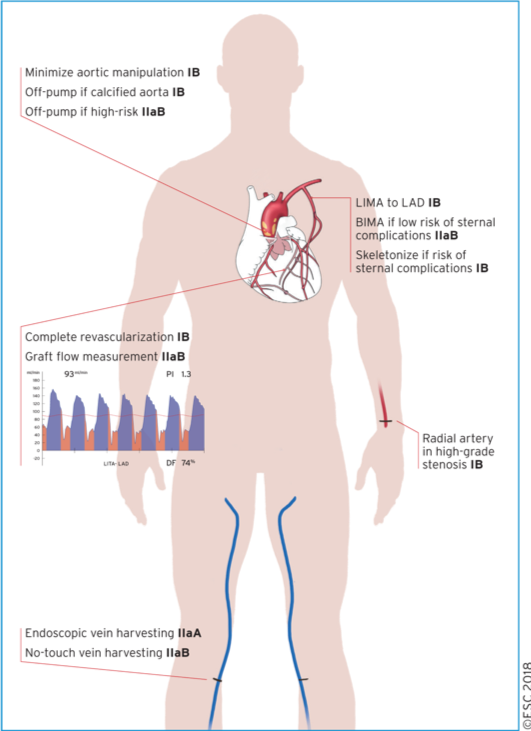 The radial artery constitutes an alternative as the second arterial graft in patients in whom BIMA grafting is not feasible, patients with a high risk of sternal wound complications, or as a third arterial graft. 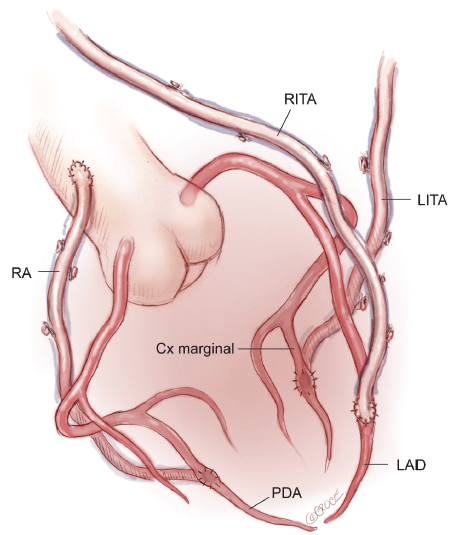 Bilateral IMA (BIMA) and radial artery have been shown to provide better patency rates than saphenous vein grafts (SVG), particularly for the left coronary artery system. The operation lasts approximately three hours and usually requires a hospital stay of 5-7 days. It is performed under general anaesthesia, which means you will be asleep during the procedure, and will feel no pain. First the arteries or veins that are to be used for your grafts, will be removed and prepared. Your surgeon will then make a cut (traditionally about 25cm long, mini sternotomy about 10-12cm long) down the middle of your breastbone (sternum) and open the ribcage to reach the heart. Next, the movement (beat) of the heart is temporarily stopped using medication and the blood re-directed to a heart-lung (bypass) machine (full bypass or mini bypass). This machine takes over the pumping action of the heart and lungs, adding oxygen to the blood and maintaining the blood circulation. With the heart now bloodless and not moving, the new grafts can be attached. Once completed, the blood is re-directed from the machine back to your heart, and the heart restarted. CABG can also be performed whilst the heart is still beating (‘off-pump’), your surgeon will discuss with you the technique that they are planning to use for you. The breastbone is re-joined using wires and the skin on your chest is sealed using dissolvable stitches. Tubes are put into small holes in your chest to drain blood and fluid that collects as part of the normal healing process. Off-pump coronary artery bypass surgery may be performed in certain patients with coronary artery disease. With present technology, all arteries on the heart can be bypassed off-pump. It may be ideal for certain patients who are at increased risk for complications from cardiopulmonary bypass, such as those who have heavy aortic calcification, carotid artery stenosis, prior stroke, or compromised pulmonary or renal function. Not all patients are a candidate. This is a pioneering advance technique that combines minimally invasive bypass surgery and stented angioplasty in one operation. Long-term outcome of PCI versus CABG in insulin and non-insulin-treated diabetic patients: results from the FREEDOM trial. Dangas GD, Farkouh ME, Sleeper LA, Yang M, Schoos MM, Macaya C, Abizaid A, Buller CE, Devlin G, Rodriguez AE, Lansky AJ, Siami FS, Domanski M, Fuster V; FREEDOM Investigators. J Am Coll Cardiol. 2014 Sep 23;64(12):1189-97. doi: 10.1016/j.jacc.2014.06.1182. Incidence, Characteristics, Predictors, and Outcomes of Repeat Revascularization After Percutaneous Coronary Intervention and Coronary Artery Bypass Grafting: The SYNTAX Trial at 5 Years. Parasca CA, Head SJ, Milojevic M, Mack MJ, Serruys PW, Morice MC, Mohr FW, Feldman TE, Colombo A, Dawkins KD, Holmes DR Jr, Kappetein PA; SYNTAX Investigators. JACC Cardiovasc Interv. 2016 Dec 26;9(24):2493-2507. doi: 10.1016/j.jcin.2016.09.044. 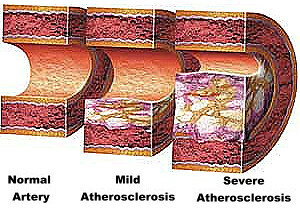 ACC/AATS/AHA/ASE/ASNC/SCAI/SCCT/STS 2017 Appropriate Use Criteria for CoronaryRevascularization in Patients With Stable Ischemic Heart Disease : A Report of the American College of Cardiology Appropriate Use Criteria Task Force, American Association for Thoracic Surgery, American Heart Association, American Society of Echocardiography, American Society of Nuclear Cardiology, Society for Cardiovascular Angiography and Interventions, Society of Cardiovascular Computed Tomography, and Society of Thoracic Surgeons. Patel MR, Calhoon JH, Dehmer GJ, Grantham JA, Maddox TM, Maron DJ, Smith PK. J Nucl Cardiol. 2017 Jun 12. doi: 10.1007/s12350-017-0917-9. Randomized Trial of Bilateral versus Single Internal-Thoracic-Artery Grafts. Taggart DP, Altman DG, Gray AM, Lees B, Gerry S, Benedetto U, Flather M; ART Investigators. N Engl J Med. 2016 Dec 29;375(26):2540-9. doi: 10.1056/NEJMoa1610021. Coronary revascularization–2009: state of the art. Taggart DP. Semin Thorac Cardiovasc Surg. 2009 Fall;21(3):196-8. PCI or CABG in coronary artery disease? Taggart DP. Lancet. 2009 Apr 4;373 (9670):1150-2. A prospective study of external stenting of saphenous vein grafts to the right coronary artery: the VEST II study. Taggart DP, Amin S, Djordjevic J, Oikonomou EK, Thomas S, Kampoli AM, Sabharwal N, Antoniades C, Krasopoulos G. Eur J Cardiothorac Surg. 2017 May 1;51(5):952-958. doi: 10.1093/ejcts/ezw438. Outcomes in patients with de novo left main disease treated with either percutaneous coronary intervention using paclitaxel-eluting stents or coronary artery bypass graft treatment in the Synergy Between Percutaneous Coronary Intervention with TAXUS and Cardiac Surgery (SYNTAX) trial. Morice MC, Serruys PW, Kappetein AP, Feldman TE, Ståhle E, Colombo A, Mack MJ, Holmes DR, Torracca L, van Es GA, Leadley K, Dawkins KD, Mohr F. Circulation. 2010 Jun 22;121(24):2645-53. Best way to revascularize patients with main stem and three-vessel lesions. Patients should be operated! Reichenspurner H, Conradi L, Cremer J, Mohr FW. Clin Res Cardiol. 2010 Jul 9. Myocardial viability and cardiac dyssynchrony as strong predictors of perioperative mortality in high-risk patients with ischemic cardiomyopathy having coronary artery bypass surgery. Maruskova M, Gregor P, Bartunek J, Tintera J, Penicka M. J Thorac Cardiovasc Surg. 2009 Jul;138(1):62-8. Epub 2009 Feb 7. Contrast-enhanced cardiac MRI before coronary artery bypass surgery: impact of myocardial scar extent on bypass flow. Hunold P, Massoudy P, Boehm C, Schlosser T, Nassenstein K, Knipp S, Eggebrecht H, Thielmann M, Erbel R, Jakob H, Barkhausen J. Eur Radiol. 2008 Dec;18(12):2756-64.